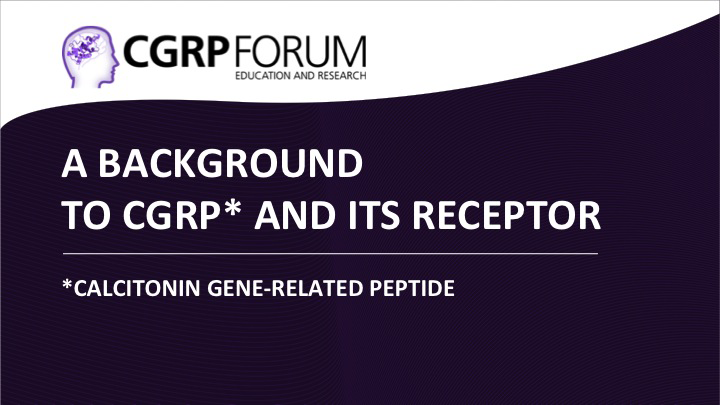 This slide deck overviews CGRP and its role in migraine pathophysiology. CGRP is a 37-amino acid neuropeptide derived from the gene encoding calcitonin. CGRP is a very potent vasodilator of the cerebral circulation. First discovered over 30 years ago, there is now much evidence supporting the role of CGRP in migraine. Studies have been critical in defining where CGRP and its receptor are located in the peripheral and central nervous system. Notably, the trigeminovascular system has been identified as having a key role, both in the synthesis and release of CGRP, suggesting that this is a key target for CGRP inhibition.